Fifteen credits were all he needed. That’s what the school district in California where Adam Sambrano works as a career-guidance specialist required for a bump in pay. But when he saw the syllabus for a graduate course he’d enrolled in last year at Arizona State University, he knew he was in trouble. Among the assignments was a 19-page paper, longer than anything he’d ever written. The idea of that much research worried Mr. Sambrano, who also spends time serving in the Army National Guard. Before the class started, he went on Craigslist and enlisted the service of a professional cheater. For $1,000 — less than the monthly housing allowance he was receiving through the GI Bill, he says — Mr. Sambrano hired a stranger to take his entire course. 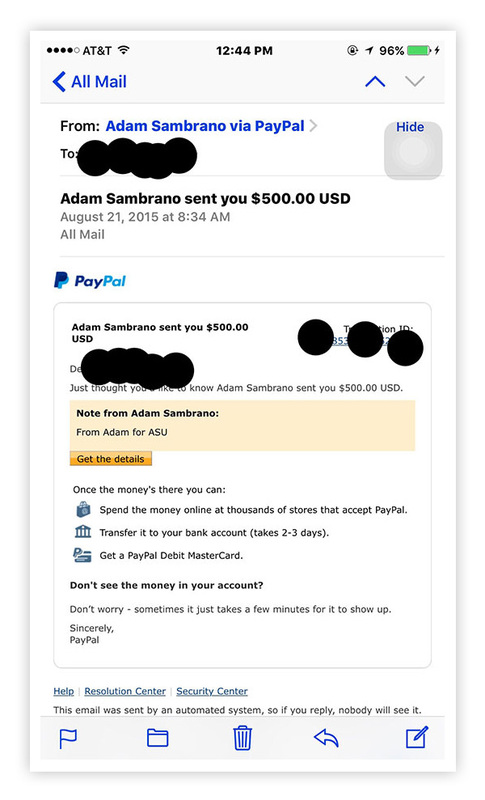 He transferred $500 upfront, “From Adam for ASU,” according to a receipt obtained by The Chronicle. Then he just waited for the cheater to do his work. On any given day, thousands of students go online seeking academic relief. They are first-years and transfers overwhelmed by the curriculum, international students with poor English skills, lazy undergrads with easy access to a credit card. They are nurses, teachers, and government workers too busy to pursue the advanced degrees they’ve decided they need. The Chronicle spoke with people who run cheating companies and those who do the cheating. The demand has been around for decades. But the industry is in rapid transition. 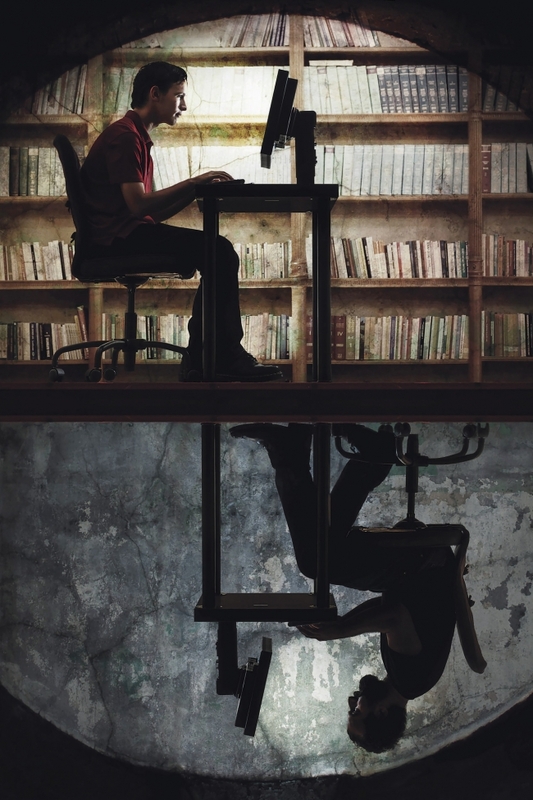 Just as higher education is changing, embracing a revolution in online learning, the cheating business is transforming as well, finding new and more insidious ways to undermine academic integrity. A decade ago, cheating consisted largely of students’ buying papers off the internet. That’s still where much of the money is. But in recent years, a new underground economy has emerged, offering any academic service a student could want. Now it’s not just a paper or one-off assignment. It’s the quiz next week, the assignment after that, the answers served up on the final. Increasingly, it’s the whole class. And if students are paying someone to take one course, what’s stopping them from buying their entire degree? The whole-class market is maturing fast. More than a dozen websites now specialize in taking entire online courses, including BoostMyGrade.com, OnlineClassHelp.com, and TakeYourClass.com. One of them, NoNeedtoStudy.com, advertises that it has completed courses for more than 11,000 students at such colleges as Duke, Michigan State, even Harvard. As cheating companies expand their reach, colleges have little incentive to slow their growth. There’s no money in catching the cheaters. But there’s a lot of money in upping enrollment. Two professors at Western Carolina University were so concerned about the encroachment of cheating that they set up a fake online class to learn more about the industry’s tactics, and see what they could detect. About a dozen students agreed to enroll in the introductory psychology course, including John Baley, then a graduate student in clinical psychology. They were provided with fake names, email addresses, and ID numbers, plus a pot of money for cheating services. Half were asked to cheat, and they did so in a variety of ways, collaborating inappropriately with classmates, buying papers, and paying others to take tests. Mr. Baley went looking for a company to take the whole class for him. He typed a few words into his browser — “cheat for me in my online class” — and turned up dozens of results. Many sites seemed untrustworthy: Their content was misspelled or grammatically incorrect, or their customer-service reps had trouble with basic English. Some requested confidential banking information or asked him to enter it into a website with no security protection. John Baley, now a law student, hired a company to complete all of his work in a fake online class that professors at Western Carolina U. had set up as a research experiment. The professors — who were on the lookout for cheaters — didn’t catch him. But one company impressed him. Its representatives responded promptly, explained how their colleagues would complete the course, and guaranteed a B or better — or his money back. He agreed to pay the company $900, half upfront, and handed over his course username and password. Over the next 10 weeks, the company, which Mr. Baley declined to name, to protect any further research, passed him from the customer-service staff to the management team to the person who took his course. At each stage, he says, he dealt with people who were efficient, responsive, and reliable. In fact, the cheaters performed better than he thought they would. They completed every assignment without prompting, at one point providing a written script for a video presentation with less than 36 hours’ notice. The instructors, Alvin Malesky, an associate professor of psychology, and Robert Crow, an assistant professor of educational research, used Turnitin and Google to check students’ work for plagiarism and monitored them to see if groups were taking exams at the same time. The professors caught several students plagiarizing material. But they didn’t spot the paid test takers, purchased papers, or coordinated assignments. And they had no clue that a person in New York to whom Mr. Baley had mailed his books was behind the A’s they were giving. Even when professors knew that students were cheating, and were trying to catch them, they came up short. Mr. Baley’s only frustration was with the barrage of marketing he got. His Facebook and Instagram feeds were saturated with ads for cheating companies, he says. That didn’t let up for months. Two years after the company took his class, its representatives are still trying to enlist him to refer other students as clients. Like any underground industry, academic cheating has its share of sloppy opportunists and savvy operators. Most work in the shadows. Click on a website that offers academic work for hire, and you’ll probably find little information about the people or company behind it. The owners often use aliases and mislead prospective customers with fake addresses and exaggerated claims. Even more-established companies can be difficult to track down. The headquarters of one, Student Network Resources, appears to be in the middle of a New Jersey cornfield. A half-mile away, in a generic strip mall, it maintains a post-office box in a packing-and-shipping store. The owner of the store says he forwards the mail to Florida. It goes to the company’s founder and president, Mark DeGaeta. Mr. DeGaeta got the idea for Student Network Resources in the late 1990s, when he was still in high school, he says in an email to The Chronicle. Over the years, he has registered more than a dozen domains, including PaperDue.com and HelpMyEssay.com, which funnel work to his company, whose name is relatively unknown. When students place a request through one of the sites, they enter their name, email address, and as much information about the assignment as possible, including due date and level (undergraduate, master’s, or doctoral). That information goes into Student Network’s system, where a price is set based on the difficulty of the assignment. The job is posted to a private board for writers, stripped of any personal details about the student. From there, a willing writer picks up the order and corresponds with the client through a private channel in which students often disclose personal information about themselves and their courses. Then the writer delivers the completed assignment. 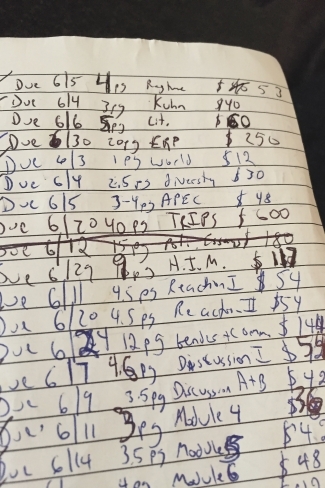 A professional cheater’s little black book of assignments shows the work he performed for students over the course of several weeks. Mr. DeGaeta is mum about the revenue he has brought in, but the business appears to be lucrative. Two longtime writers say they’ve earned as much as $10,000 a month. At peak times, the company says on its website, most of its 150 writers earn more than $1,800 a week. Writers typically pocket half the price of an order; the company gets the rest. If those numbers are accurate, annual revenue for Student Network Resources would be in the millions. The company has only two employees. The founder has made a good living, according to public records. He owns an apartment in a tony neighborhood of New York, near the United Nations building, and seems to reside near Miami Beach. But his business has fallen off in recent years, he says, as the industry has expanded overseas. Several current and former writers told The Chronicle that they had believed that. Amelia Albanese, a former community-college tutor who worked for the company in 2010, says she thought she was writing sample papers for tutors and teachers. When she realized she was doing students’ work, she quit. The company’s business depends on covering its tracks. A memo it sent to writers last year gives step-by-step instructions for wiping the metadata from documents they produce. According to Mr. DeGaeta, the memo was aimed at preventing writers from poaching clients. But if there’s no trace of a cheater on a document, a college has no way of knowing — or if an instructor suspects something, no proof — that the student didn’t do the work. Cheating has become second nature to many students. In studies, more than two-thirds of college students say they’ve cheated on an assignment. As many as half say they’d be willing to purchase one. To them, higher education is just another transaction, less about learning than about obtaining a credential. The market, which includes hundreds of websites and apps, offers a slippery slope of options. Students looking for class notes and sample tests can find years’ worth on Koofers.com, which archives exams from dozens of colleges. And a growing number of companies, including Course Hero and Chegg, offer online tutoring that attempts to stay above the fray (one expert calls such services a “gateway drug”). Many students turn to websites like Yahoo Answers or Reddit to find solutions to homework problems. And every month, hundreds of students put assignments up for bid on Freelancer.com and Upwork, where they might get a paper written for the cost of a few lattes. It’s not uncommon for students to disclose personal details in their orders, which anyone online can see. This spring a student from the University of North Carolina at Charlotte included an attachment to his Upwork order that identified his institution and the introductory philosophy class he was looking for help in. A few days later, a Ph.D. candidate in Britain went on the same site to solicit help with his dissertation. A document he attached to his order included his name and his adviser’s. Some of the most explicit exchanges happen on Craigslist, which has become a hub of cheating activity. Over two days in April, The Chronicle analyzed Craigslist posts in seven cities in which a cheater or cheating service offered to complete whole courses for students. The search turned up more than 200 ads. In many cases, the same ads ran in multiple cities, suggesting a coordinated marketing effort. The Chronicle exchanged messages with several Craigslist posters to inquire about the cost of their service and how it worked. One person who has posted regularly in the Los Angeles area said he had been in business for 10 years and had a staff of “over 20 experts.” His prices, he said, depended on the number of hours it would take to complete a class, not how well a student wanted to do. “We always get A’s and B’s,” he said in a text message. “Calculation based classes are $750. All others are $600. Anyone quoting different is not a pro and doesn’t know what they are doing. Cheap quotes = F grades. The most common way students cheat is through a simple web search — typing, for example, “essay,” “essay help,” or “write my essay.” As many as half of the visits to some sites used for cheating come through search engines, The Chronicle found. The companies that have made the biggest strides in the business have mastered the search game. Search-engine optimization efforts have helped Ultius, founded in 2011, grow fast. The Delaware-based company, with a call center in Las Vegas, has hired more than 40 employees, including engineers and customer-service representatives, according to job ads. It has contracted with more than 1,400 writers. That growth has coincided with a surge in traffic. Over a recent three-month stretch, the site drew about 520,000 visits, according to a Chronicle analysis of data compiled by SimilarWeb. Thirty to 40 percent of Ultius’s traffic comes from students’ web searches, according to estimates on Alexa, which measures internet usage. Ultius is the No. 1 or No. 2 search result that pops up when someone Googles “buy a term paper,” “buy a research paper,” or about a dozen other phrases that indicate an intent to purchase a completed assignment, according to a Chronicle analysis of search data compiled by Spyfu, a search-engine optimization tool. Boban Dedovic, 27, the company’s chairman, helped start it after three semesters as a student at the University of Maryland at College Park, during which he worked as a tutor. 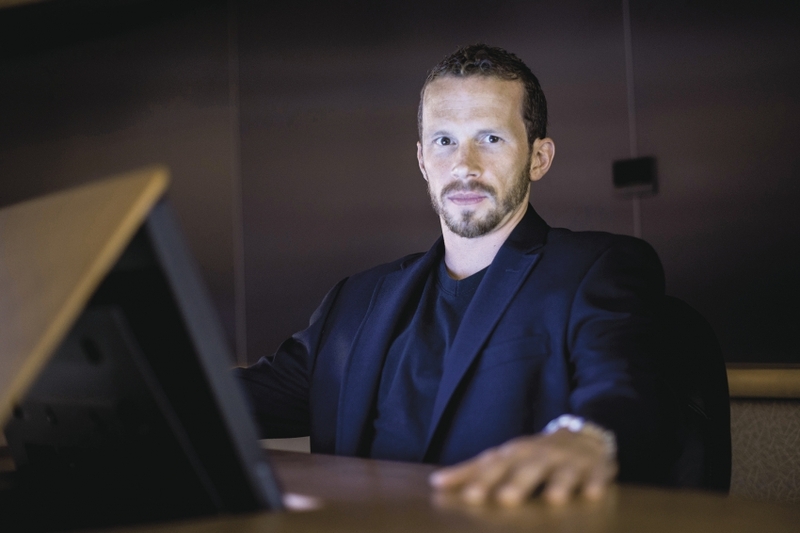 To him, Ultius is a technology company that connects customers to writers, he says via email. He denies that Ultius is part of the cheating industry, referring to it as a “doc prep service.” In a written statement, the company says it works hard to ensure that its customers don’t misuse its services, informing them of its fair-use policy (that its work is meant for reference only and must be properly cited) at least three times and requiring them to accept it. When the company suspects a problem, it conducts an investigation, drafts an internal report, and, if it finds a violation, disables the customer’s account. However, the company says, it cannot individually monitor every one of its orders. Ultius protects its business by keeping those orders private. When a student posts an assignment on Craigslist or other sites, looking for someone to pick it up, Google indexes that text, making it visible in searches. But the customer experience at Ultius occurs behind a wall, in the same way a bank keeps its clients’ information private. Because Google can’t create a record of those pages, professors wouldn’t be able to find them. The company’s dealings with one Ph.D. candidate illustrate the increasingly complex work that students are outsourcing, while faculty members remain in the dark. Last year, Ultius contracted with a student who described herself as a “single active duty parent” to help write a concept paper for her doctoral program, records show. The job included revisions requested by the chair of her dissertation committee. The Ph.D. student requested that Ultius complete a literature review and produce a theoretical framework for her dissertation. The order required the company to find data on migration patterns and economic growth in Jamaica, and to apply advanced economic theory. The company did the work, but the customer was so displeased with it that she filed a complaint with the Better Business Bureau. That complaint details the case. Ultius considers customer service a top priority, and despite 19 complaints in the past three years, mainly minor beefs over papers and assignments, it maintains an A+ rating from the BBB. The Ph.D. student threatened to go public with her story, but more often it’s the paid cheaters who make threats. After Mr. Sambrano, the high-school guidance specialist, transferred $500 to have the whole course at Arizona State done for him, he stopped hearing from his Craigslist cheater and filed a PayPal claim against him. The cheater advised him to drop the claim or he’d hand over evidence of the arrangement to the university. Mr. Sambrano, afraid he’d be expelled, dropped the charge. He says he ended up doing the class himself. Adam Sambrano, a career-guidance specialist for a school district in California, paid a professional cheater he found on Craigslist to take a graduate course at Arizona State University for him. In another case, if not for a cheater turning a student in, a college may never have known that the student was paying someone else to log in to the course and complete the work. In May an undergraduate at Colorado State University-Global Campus, dissatisfied with the quality of the work done for him, filed a PayPal claim. Angered, the cheater gave the student’s name to the instructor, along with text messages, screen shots of the student’s portal, and payment records detailing how the student had arranged to have the entire course done for him, says Jon M. Bellum, the provost. CSU-Global, an online institution with about 15,000 students, had its information-technology department look at the IP addresses used for the student’s coursework and found more than one. Mr. Bellum would not disclose the penalty the student faced, citing privacy law, but says such abuses can result in expulsion. Often, though, the university is not aware of the violation. 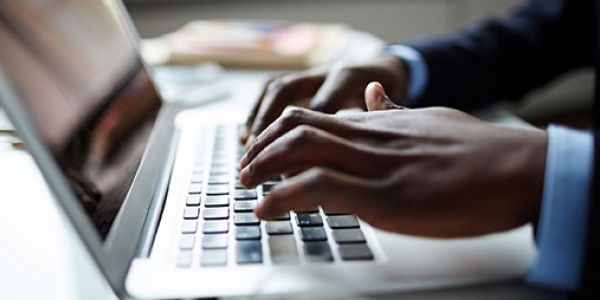 Coursera, an online education platform employed by dozens of prominent colleges, uses webcams and “keyboard dynamics,” which attempt to verify students’ identities on the basis of their typing patterns. But that doesn’t do much good if the cheater is always typing. CSU-Global says it spends about $60,000 a year administering random identity checks on its students. The tests require them to provide answers to personal questions like what banks service their loans or what streets they’ve lived on. If they don’t answer accurately, they can’t log in to their classes. About 2 percent of identity checks result in students’ getting locked out of the CSU system. Other institutions have blocked access to sites that help students cheat. Victor Valley College, in California, has prevented anyone on a campus computer from accessing the website of Student Network Resources. But students can turn to their own laptops or other devices. The biggest key to fighting the problem is faculty engagement, says Tricia Bertram Gallant, a former president of the International Center for Academic Integrity. She often speaks with professors about the business, she says, and finds them surprised that someone else could be doing students’ work. In studies, as many as half of college students say they’d be willing to purchase an assignment. Others are in denial that it could happen in their classes. And even those who know about it and want to stop it say they’re too busy, or feel that the fight is futile, with new cheating companies popping up all the time. But some professors are catching on. Last fall, Megan Elwood Madden, an associate professor in the School of Geology and Geophysics at the University of Oklahoma, spotted a suspicious passage in a student’s paper. She ran it through Turnitin, finding several plagiarized sources but no match for the bulk of the text. So she Googled the student’s research topic and found the assignment posted on Course Hero with the student’s request for help. A web search did not turn up the text the student had handed in, because it was hidden in Course Hero’s system. But once Ms. Elwood Madden had logged in to the site, she could see communication between the student and a contractor suggesting that the student had had the work completed for him, the professor said in an email. She discovered that the student had used Course Hero to arrange work in at least four other classes as well. The revelations led the university to expel the student. Such stories are rare, academic-integrity officers say, because there are so few would-be enforcers in pursuit. After The Chronicle published an article about the Western Carolina experiment, two federal law-enforcement officials contacted the professors, eager to hear more about the business. William Josephson, a former assistant attorney general in New York who has investigated fraud, says companies that assume false identities violate federal laws governing interstate commerce. Laws in at least 17 states prohibit students from using cheating services to complete their assignments. But prosecutors aren’t enforcing them. Faculty members on the front lines are no more active. That’s also true in other countries where the cheating industry has developed. This spring, Marcus J. Ball, a higher-education reformer in Britain, came across an advertisement for academic cheating services on the wall of a London subway station. The ad offended Mr. Ball, who began emailing college administrators and professors, trying to persuade them to sign a petition for the British government to debate the issue of contract cheating. His goal was to create a “unified block” of people willing to stand up to the cheating companies, with hopes of taking the fight to Canada, the United States, and elsewhere. In May, Mr. Ball contacted more than 250 college officials, including academic-integrity leaders in several countries. Only five responded. Last year, Ms. Bertram Gallant, who is director of the academic-integrity office at the University of California at San Diego, organized a dozen international experts to study the growth of contract cheating and how to stop it. Tricia Bertram Gallant, a former president of the International Center for Academic Integrity, says professors are often surprised that someone else could be doing students’ work. “When I tell them about contract cheating, they’re shocked,” she says. The group laid out a series of big goals. Chief among them: Mobilize faculty members and students to demand laws making it more difficult for cheating companies to operate. It is creating a tool kit to help professors detect and prevent cheating. And it is organizing an international awareness day to bring more attention to the problem. College leaders haven’t helped, she says. Many have failed to make the issue a priority. 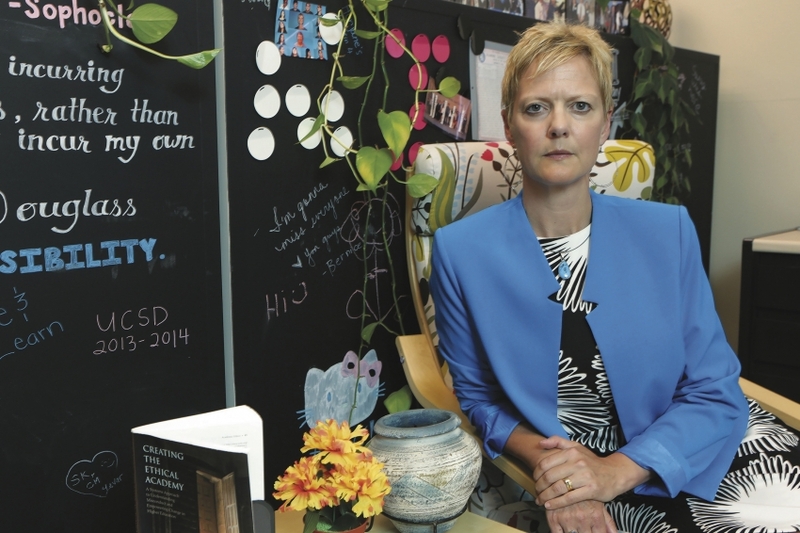 Few colleges have academic-integrity offices, she says, or devote dollars to the problem. Colleges also might need to rethink their approach, says Ms. Bertram Gallant. As online education continues to grow, and cheating companies have more opportunities to infiltrate classes, institutions would do well to enlist people with the skills to ferret out violations, she says. While educators may be equipped to catch plagiarism, they don’t have the tools to track a paid cheater who is assuming someone else’s identity. Instead, colleges continue to rely on proud traditions to fight the scourge of cheating. This fall, as students return to campus, some colleges will require them to sign an honor code. Others will spell out for them the potential consequences of academic dishonesty. Dan Bauman and Ben Myers contributed reporting to this article. This entry was posted in Uncategorized on August 29, 2016 by pudentilla.